We have had a few days now of beautiful sunny weather, and although it is a bit early for all of this spring weather, I am loving it! :) Whenever sunshine pours in through my windows I am motivated to get things clean and organized. This year I have some fun goals to deeply organize our home and get things more streamlined. I can't stand clutter, but at the same time I am drawn to eclectic baubles and collectibles. I also tend to be a natural at archiving family history and memorabilia. Both traits that can lead to too much clutter. My youngest child is graduating this year, and I am transitioning from a mom of kids to a busy household with young adults. So this year I wanted to honor that transition by really thinning out unimportant things to make our space easier to maintain, and not bogged down with too much stuff. Since Lent began this past Wednesday I thought it was the perfect time to start this project, instead of giving up something like sweets, which I am not really inclined to do, I decided to give up stuff. 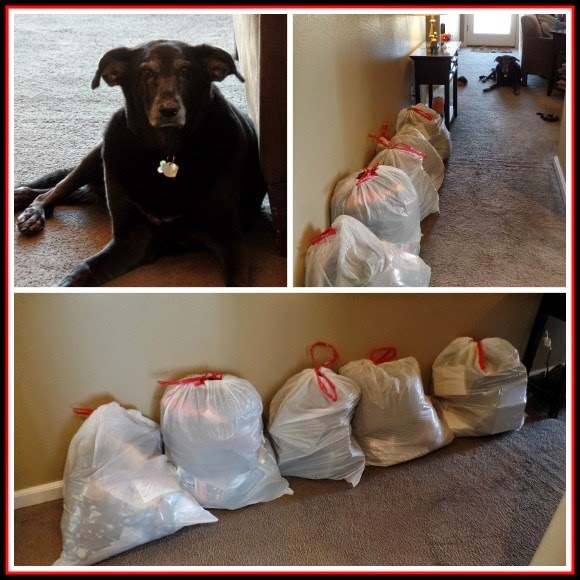 I have decided to get rid of 40 bags of clutter in 40 days. I am off to a good start with five bags done. My sweet old dog Xena is overseeing the process, and making sure her toys are not decluttered! This won't be too easy since I did a good declutter of closets and such this past autumn, but it is surprising what you can go back and decide to get rid of after all when you really approach it with fervor. I got rid of clothes that have been in my closet for some time, they were beautiful and good quality, but either they were not my style or not my color. I am often drawn to clothes in the colors I like, but colors I may like in a home or garden aren't necessarily colors I should be wearing, so they sit in my closet, taking up room where clothes in colors I actually will wear could be. Like I said, I am drawn to collectibles. I am trying to narrow down what I keep to the collections that are most important to me. One of my first collections ever was my kaleidoscope collection. 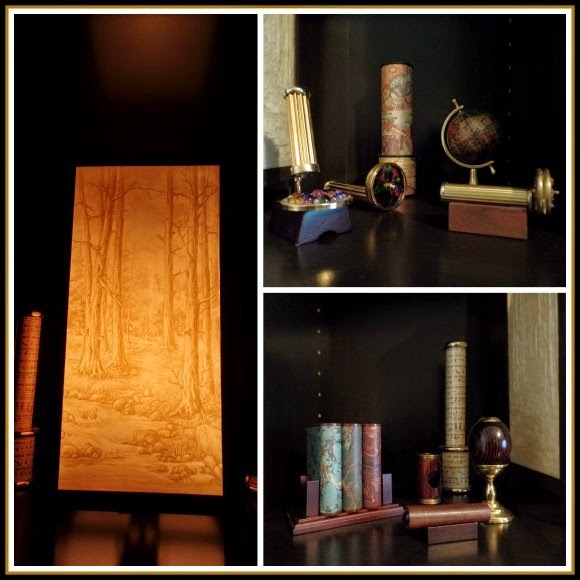 I keep out my favorite ones on the top shelf of the bookcase in my bedroom surrounding a pretty luminary lamp I found years ago. I know I only want to keep the items that I like enough to move when I dust, that helps limit my collections to a reasonable amount. :) This week I will be tackling my office, we need to really thin it out and make space for all of us to have a computer station, not sure how that will happen in my tiny office but I'm up for the challenge! Plus I will be going through holiday stuff, every time I try to thin out my holiday decor it is the holiday season, when I am more sentimentally attached to the items. I am hoping that by sorting them in the off season I will have a more logical frame of mind. I hope to post more about my decluttering spring project over the next month. In other news, it is Girl Scout cookie season. The sweetest little Daisy Scout came around with her mother selling cookies. My Sarah was a Daisy Scout when she was little and it brought back great memories. So of course I bought a few boxes! The perfect little snack, cookies and milk, a nice treat for a mid spring cleaning break! 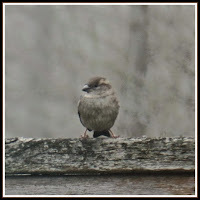 Check out my recent post about The Great Backyard Bird Count! Decluttering and organizing gives me a sense of accomplishment & peace! I've been working at it for 2 years on & off now...I'm not sure it ever ends, but it's awesome to have less stuff to take care of, store! the Girl Guide mint cookies are my favourite here in Canada. Good luck with the decluttering. De~cluttering is an endless process ~ either de~clutter or buy a bigger house! 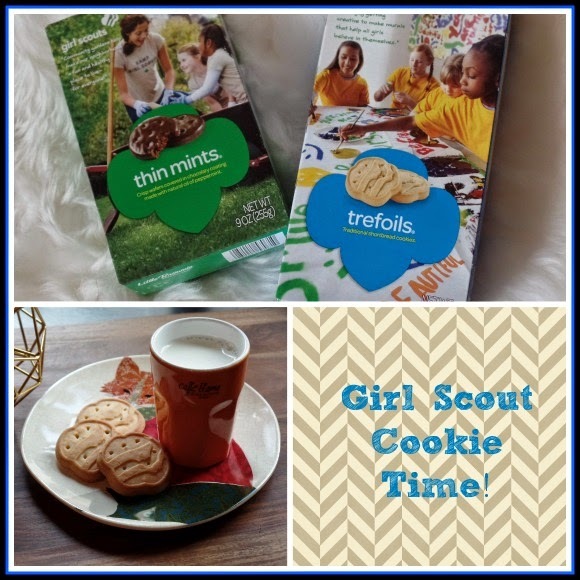 I miss Girl Scout Cookies! We're decluttering here,too. 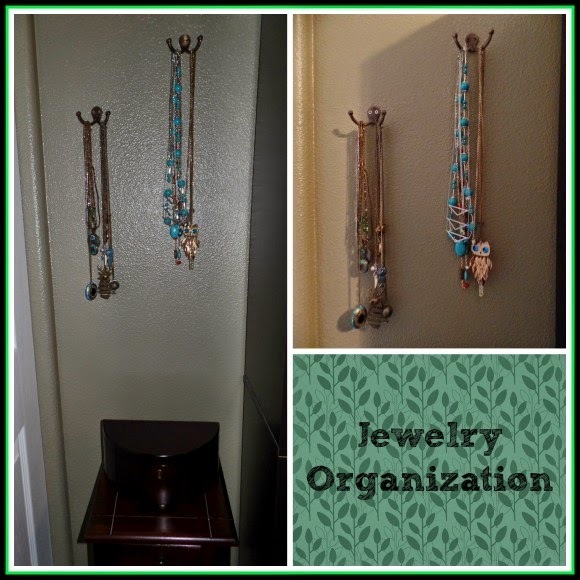 That's a great idea for your jewelry. I spend so much time detangling my long necklaces. It's good to hear that there are still Girl Scouts out there. It was a wonderful organization. Best of luck on your endeavors, April! Oh I will have to find a Girl Scout! I used to sell so many of those! Thank you for joining Home Sweet Home! I don’t typically do spring cleaning I try to deep clean smaller areas spaced out over the year.